A member of Ouattara forces looks through binoculars ahead of an attack on Laurent Gbagbo's Abidjan residence Wednesday. (CNN) -- Forces loyal to Ivory Coast's elected President Alassane Ouattara stormed the residence of his rival, Laurent Gbagbo, on Wednesday, an Ouattara spokeswoman said, potentially heralding the end of a bloody conflict in the West African country. The Ouattara forces are inside Gbagbo's residence but have not captured him, Affoussy Bamba said from the main city, Abidjan. They discovered heavy weapons inside the residence, she said. A spokesman for Gbagbo, Ahoua Don Mello, confirmed the residence was under attack, expressing amazement at the assault. Gbagbo is prepared to discuss African Union proposals for a handover of power but cannot talk about surrender before discussions even begin, Mello said. He would not confirm Gbagbo is in the residence under attack but said he was in Abidjan. "They are trying to get him and to kill him," Mello said. U.N. attack helicopters could resume their operations Wednesday, said Alain Le Roy, the head of U.N. peacekeeping operations. He said the helicopters would target heavy weapons that Gbagbo's supporters are using at the presidential residence. Meanwhile, Japan's Ministry of Foreign Affairs said in a statement that forces believed to be loyal to Gbagbo broke into the official residence of Yoshifumi Okamura, Japan's ambassador to the Ivory Coast, on Wednesday. Okamura, seven staff members and a security guard were evacuated from the residence with the support of French and U.N. peacekeeping forces, the ministry said. Hundreds of people have been killed in the cocoa-producing country since Gbagbo rejected the results of an election in November. The United Nations and African Union have said Ouattara, a former prime minister, defeated Gbagbo, who was running for re-election. As fighting and looting rage, the humanitarian situation is worsening, the International Committee for the Red Cross said. An ICRC-chartered aircraft landed Wednesday in the northern town of Man, carrying nearly 12 tons of supplies for people hit by the warfare. U.N. Secretary-General Ban Ki-moon on Wednesday called Gbagbo cowardly. "I can't understand why he is refusing to cede his power against the total will of the international community," Ban said, urging the self-declared president to think about the future and the security of his people. French Foreign Minister Alain Juppe, who has been closely involved with events in the former French colony, said negotiations with Gbagbo had failed because of his "obstinacy." Ouattara set the terms for Gbagbo's surrender, Juppe said. Juppe told parliament in Paris that French forces were not involved in the assault on Gbagbo's residence, rejecting allegations by Gbagbo supporters. A senior American source with knowledge of the situation also said negotiations had failed. "The opportunity for negotiations with Laurent Gbagbo is over. He has closed the door on negotiations," said the source, asking not to be named because of the sensitivity of the situation. Gbagbo "is an individual that did not accept he lost. That's why we are here today," the source said. Ouattara's forces have steadily been closing in on Gbagbo in the past week amid claims of massacres by both sides. An Ouattara representative said Gbagbo had left them no alternative but to attack. "Negotiations with Gbagbo have failed," Mamadou Toure said, as the assault began Wednesday. "Gbagbo decided not to surrender, so Ouattara's forces were left with no other choice. The aim is to get him out of the residence without harming him." Toure, who is at the Ivory Coast Embassy in Paris, added, "President Alassane Ouattara will have to decide what happens next." Another Ouattara representative said that Gbagbo "will be brought to justice." Gbagbo seemed to be on the point of surrender Tuesday after four months of conflict, but then he backtracked. It "seems like he has lost his mind. ... It means that there is something wrong with this guy," Ouattara spokesman Patrick Achi said. Ouattara's side is appealing directly to Gbagbo's fighters to put down their weapons, Achi said. "We cannot sit and wait for him to become reasonable" in the face of the "humanitarian catastrophe" facing Abidjan, Achi said. The city of 5 million people had "no more electricity, no more sanitation and bodies on the street," he said. Ouattara's forces entered Abidjan on Thursday after an offensive that swept across the country. 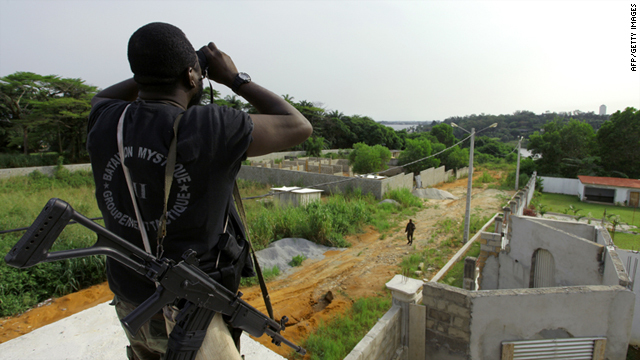 When they arrived, the sporadic post-election violence that had plagued Abidjan for months escalated into war. Ivory Coast's ambassador to the United Nations said Tuesday he thought Gbagbo "knows everything is over for him." "His military forces have been defeated. He is alone now," said Youssoufou Bamba. Bamba said Gbagbo should go on trial "because he has committed so much crime" against civilian and peaceful demonstrators. But Kenyan Prime Minister Raila Odinga, who served as the African Union's main negotiator in Ivory Coast, said Ouattara and others should consider allowing safe passage for Gbagbo to Angola, South Africa or another country. International leaders, including U.S. President Barack Obama, have been demanding that Gbagbo step down immediately for the good of the country. The political chaos and violence has claimed at least hundreds of lives. In one of the bloodiest incidents yet, the International Committee for the Red Cross reported the killings of 800 people last week in the western cocoa-producing town of Duekoue. As for the humanitarian crisis, Dominique Liengme, who heads the ICRC delegation in the Ivory Coast, said medical supplies and items needed to upgrade water systems are on the aircraft that landed in the Ivory Coast. "Medicines and other medical items will be distributed, mainly in hospitals and health care centers in the west of the country. They will then be delivered in Abidjan as soon as security conditions permit," Liengme said. Civilians have been hit hard by the effects of the fighting, dealing with shortages of water, electricity and food. Liengme said hospital staffers have had to deal with shortages in medical supplies and working "without running water or electricity." It's hard for humanitarian workers to perform their duties because of the lack of security, the ICRC said. Juppe said Wednesday that all that remained to discuss was how Gbagbo would leave. "We have asked the U.N. to guarantee his physical well-being and that of his family, that's an important point, and then to organize the conditions of his departure," Juppe said on French radio. "That's the only thing left to negotiate from now on." Gbagbo denied in an interview Tuesday that he planned to go down fighting, calling himself a man who "loves life." "I'm not a kamikaze. ... I don't look for death," he told France's LCI television.